In an effort to help prevent abuse, Lamar Advertising of Cedar Rapids has teamed up with Preventing Abuse, an organization that is dedicated to helping protect women, children and families from abuse. Lamar has donated advertising space on over 15 Poster and Digital Billboard units in Cedar Rapids, Waterloo and Cedar Falls to help raise awareness about the organization's upcoming conference. After two high profile abductions occurred in Eastern Iowa within the past year, Lamar’s Sales Manager in Cedar Rapids was compelled to get involved in preventing abuse. Lamar donated over $10,000 of advertising space to support the Preventing Abuse organization. The billboards, which went up this month, include details about the Preventing Abuse Conference. Billboards donated by Lamar Advertising's Cedar Rapids office display information about the upcoming Preventing Abuse Conference. The Preventing Abuse Conference will be hosted on August 9 – 10 in Cedar Rapids, Iowa. The organization will educate attendees about human trafficking, child protection, internet safety and more. Architectural Record has named its 2013 Good Design is Good Business Award recipients, selecting 12 projects ranging “from a power plant turned dance center, to a new daylight-filled factory in Mexico, to a respectful renovation of an iconic 1950s bank in New York City”. 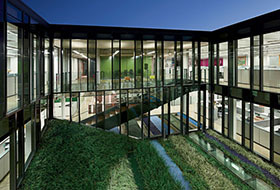 One of which went to Eskew+Dumez+Ripple for their design of the Lamar Advertising Corporate Headquarters in Baton Rouge, Louisiana. 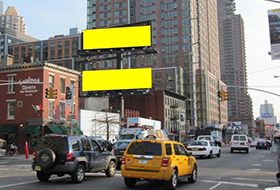 Lamar of New York and New Jersey is expanding its inventory with a new Double-Stack Billboard unit located in Manhattan's Hell's Kitchen neighborhood. This is an excellent, high-traffic location on the West Side, and the double-stack format offers unparalleled visibility and creative opportunities for advertisers.